Stopwatch function - 1/100 sec. - 24 hours. 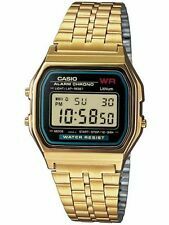 100% Authentic Casio Watch. The button tones for using the mode button can be turned off. 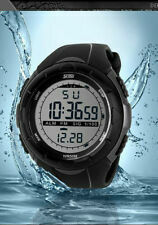 100M Water resistance classification, perfect for swimming and snorkelling: the watch is water resistant to 10 Bar. 1 X Casio Watch. 5 Years Warranty. Authenticity check. Easy to read display: built-in LED light illuminates watch face from side, ideal for dark or low-light viewing. Microlight: A built-in light illuminates the watch face from the side. 7 Years - 1 Battery: The battery supplies the watch with sufficient energy for approx. 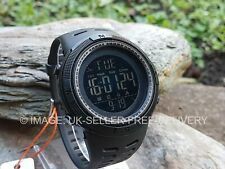 4.5 out of 5 stars - CASIO F-91W Digital LCD Watch with Chrono, Alarm 100% AUTHENTIC RETAIL PACKED !! 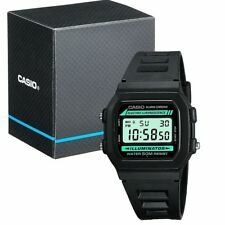 220 product ratings220 product ratings - CASIO F-91W Digital LCD Watch with Chrono, Alarm 100% AUTHENTIC RETAIL PACKED !! Black 10 Year Battery Casual Classic Watch with a black resin band and silver case. The larger case size makes this watch suitable for unisex uses. Muli-function Alarm with Snooze. 12 and 24 hour formats, extra long battery life uses a single popular/cheap CR2025 battery. Be different and wear this fashionable LED watch. 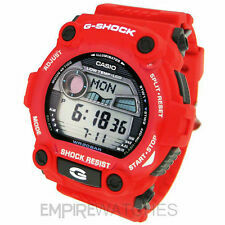 It displays hours, minutes and seconds as well as the date all in red numbers against a black background. 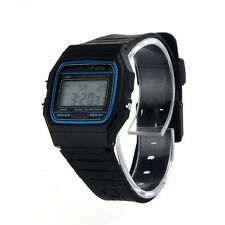 1 x Black LED Digital Watch. Displays hours, minutes, seconds, month and date. 1⁄100 second stopwatch with a count up to 59:59.99 (almost one hour). The watch uses a faint, green LED back light located to the left of the display for illumination. The watch is reported to be accurate to ±30 seconds per month by the manufacturer. 1 X Casio Watch. Original picture has been taken for proper view. 1 Year Warranty. Authenticity check. If you are searching for an accessory with ultimate precision, choose a digital watch. Thanks to their functional and stylish displays, you can pair them with any outfit. These digital watches are generally built with backlighting, so you can easily see the time in poor lighting conditions. With numerous functions and features, you can choose one that has exactly what you're looking for. With their modern styles, stainless steel case wristwatches are fantastic for upgrading your wardrobe. Constructed with scratch-resistant designs, they are unlikely to get damaged by accidental drops. Silicone case wristwatches are great for people with more sensitive skin. The silicone cases are flexible, which ensure ultimate comfort. Mechanical movement wristwatches showcase the perfect combination of traditional design and ease of use. The second hands rotate in a sweeping motion, moving continuously around the dial. Quartz movement watches are classic timepieces that are easy to maintain. The movements are renowned for their accuracy and precision, making these watches exceptionally reliable. 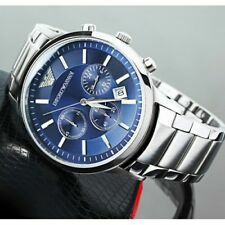 Which digital wristwatches are the most popular among ebay customers?